We will use the Pattern Rigid Move to remove the interference between the Turnlamp pins and the Bracket holes. The purpose of the Pattern Rigid Move is to assemble two rigid parts that use patterns of pins and holes as the secondary and tertiary locators. When Nominal Build is performed, the move routine will fit together the patterns of holes and pins. Since the Pattern Rigid Move is locating only the secondary and tertiary locators, a preliminary move is first needed to move the object part primary locators to the target part primary locators. This can be done with a preliminary move such as a Step Plane Move which we already have for the Turnlamp. Click the Moves button then select the Lamp_SubAsmLamp_SubAsm_Lesson8. Select Pattern Rigid from the drop-down list next to [Add Analyst]. Click [Add Analyst]. This will open the Pattern Rigid Move dialog. Change the Name to "Turnlamp_to_Bracket_Pattern". Add the Description of "4way, 2way, and clearance hole and pin pattern." Set the Type to Fixed Fastener. Under Object Features, select Click to Add[ + ]. Select the features TurnLp_YZ, TurnLp_Y, and TurnLp_Clear in the Turnlamp. Click [OK][Close] to close the Pick FeatureSelect dialog. Under Target Features, select Click to Add[ + ]. Select the features TurnLp_YZ, TurnLp_Y, and TurnLp_Clear in the Bracket. The Feature tab should look like the following image. Set the Dir. Type to AssocDir. Select the Move Parts tab. Verify the Turnlamp is in the Move Parts list. Click [OK] to save the move and close the dialog. 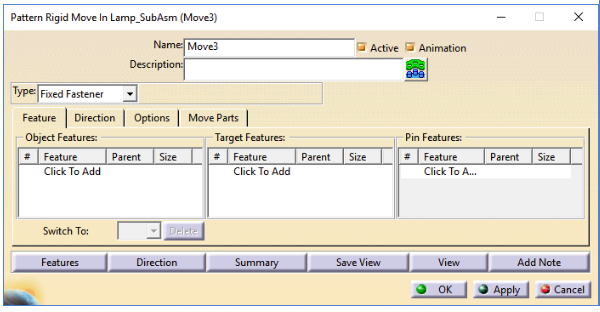 Click [OK] to close the Moves dialog. Select Nominal Build then Run Analysis. Set the Total Runs to 2000. Check the box for Retain Failed Assemblies in Statistics.